Is evil born, or is it made? Can one who was once a villain see the error of their ways and become a force for good? These are some of the questions that developers have sought to answer concerning the divisive ruler of Carthridge, Baron Zachareth. While he was once a powerful opponent the players struggled to defeat, he now fights alongside the Daqan Lords, defending Terrinoth from the evil that grows in the Mistlands. While those in the Land of Steel are still wary of the Baron, few can argue with his effectiveness as both a leader and a warrior. How is such change possible? 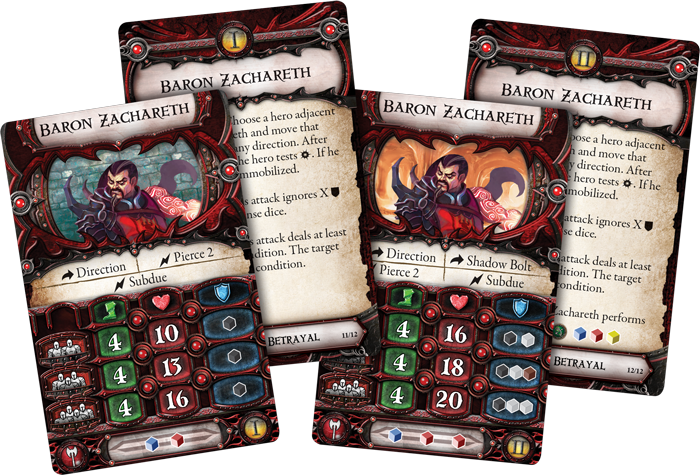 Today, developer Michael Gernes gives us insight into the process of translating characters between games by examining how Baron Zachareth evolved from his first appearance in Descent: Journeys in the Dark Second Edition to his latest incarnation in Runewars Miniatures Game! My favorite part of my work with Runewars Miniatures Game has been the chance to pull back the curtain on Terrinoth and the greater world of Mennara, especially regarding its storied history and competing power groups. We've been excited to add Baron Zachareth to the game since its earliest days, and he's a great example of the opportunity we've had as a team to build on the foundation of our previous games. Baron Zachareth was originally introduced as a key villain in Descent: Journeys in the Dark Second Edition. His depiction as both a charismatic and influential Daqan noble and a secret wielder of dark powers caught the attention of Runewars designer Andrew Fischer and myself. While the events in Descent represent one possible destiny for Zachareth, they're also a great window into a mirror aspect of Daqan culture. The Daqan Lords are a proud civilization that celebrates virtues like courage, heroism, and pride. These values have helped them stand against the great Darknesses, but they have caused the Daqan to stumble due to the negative side of those traits: unchecked ambition and hubris. 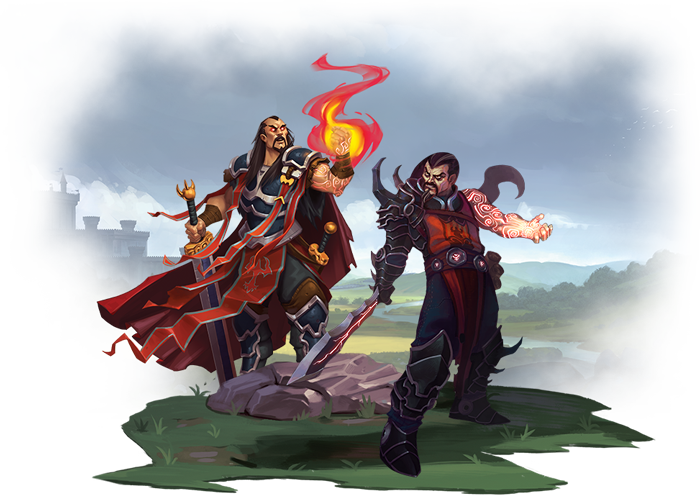 Terrinoth is also a feudal society, so although the barons sit in council together as peers, their ties to the greater kingdom are often weaker than their regional interests. 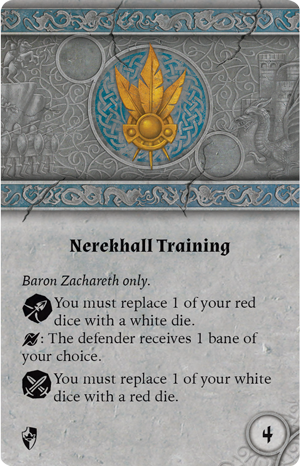 A character like Zachareth captures these contradictions: his noble allies view him as a masterful leader who cares about Terrinoth's security, but Zachareth's interests (and those of his barony) clearly come first. This distinguishes him from more selfless, quintessentially Daqan characters like Kari Wraithstalker and Lord Hawthorne. While they are noble defenders of the realm, Zachareth is a schemer. Zachareth's history with arcane power and dark artifacts further sets him apart from other Daqan heroes. It also helps to personify two of the signature magical traditions of Terrinoth: the runelore of the Greyhaven mages and the dark wizardry of Nerekhall. 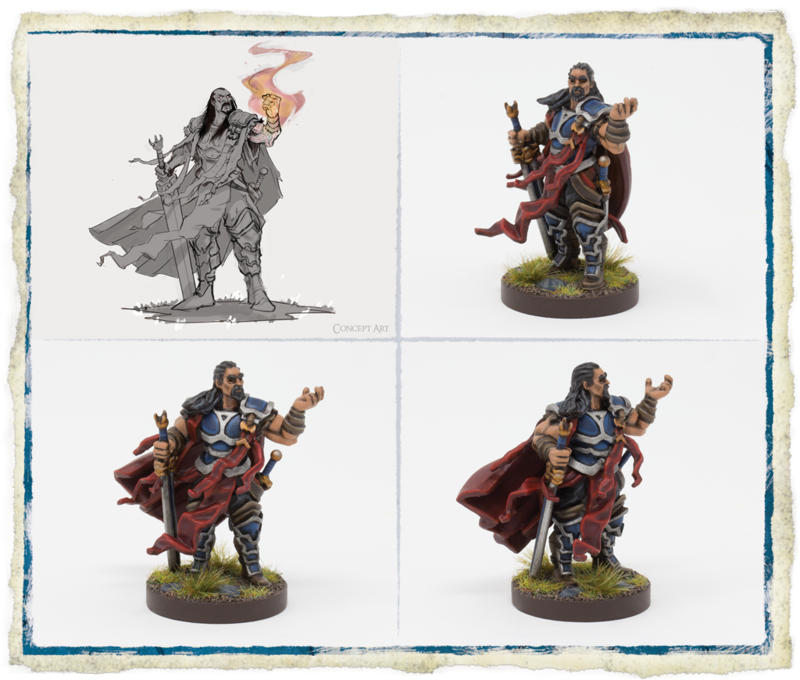 The influence of magic is an essential part of the Daqan Lords’ history and military power, as exemplified in Runewars Miniatures Game by the Rune Golems that march in the Daqan hosts. Zachareth’s imposing runic mount, Backbreaker, only reinforces these ties to Terrinoth’s magic. We wanted to represent each of these themes through Baron Zachareth’s game mechanics, especially his divided loyalties. Like all heroes, Zachareth is a powerful unit on the battlefield, but his strengths should feel unique, especially from the other Daqan heroes. 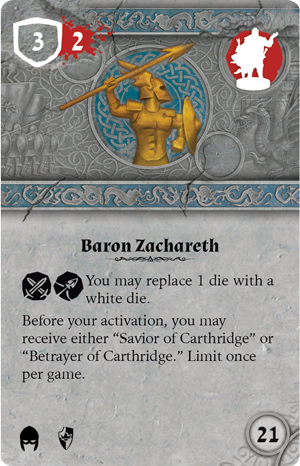 Early on we decided that Zachareth’s central mechanic would be his condition cards: Savior of Carthridge and Betrayer of Carthridge. This gave us a great way to put the decision into players’ hands over which path to walk. As an additional thematic benefit, this underscores Zachareth’s plotting nature by keeping opponents uncertain about his intentions! We wanted to make Baron Zachareth’s cards represent his choice between using his powers to support his allies or drawing their strength for his own ends. We also worked to make him feel like a character whose magical studies gave him an affinity for commanding Rune Golems. The concept of vitality, our first new boon token, came out of this. Inspiration tokens help units store morale, but I wanted a way to directly boost a unit’s resiliency. This would be helpful for any unit, but it works best with units that have high defense and low wound values. 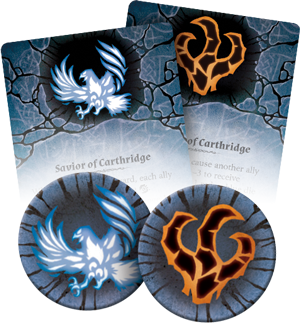 Vitality tokens became one of the defining new mechanics for Zachareth, representing both his studies into rune shards and the animating forces of life. Zachareth’s Runic Augmentation ability felt like a natural combination of theme and mechanic. We even wanted Zachareth’s dial to feel like the moves of a cunning warrior-mage. For this reason, he has march and shift options in both blue and green stances and can combine his ranged attack with several green movement modifiers. Zachareth can also always call on his white skill modifier. There is a tradeoff for this versatility, however: Zachareth only has one melee action, at initiative four. Todd Michlitsch created this dial layout early on and I think it excellently captured the baron’s character. As with other heroes our team has designed, the goal for Zachareth’s upgrades was to give players lots of choices to customize his abilities. We also wanted to use these upgrades to reinforce and explore different aspects of his character. Unique upgrades lent themselves to this especially well, and I felt Zachareth’s unique upgrades should reflect his reliance on magic and secrecy. 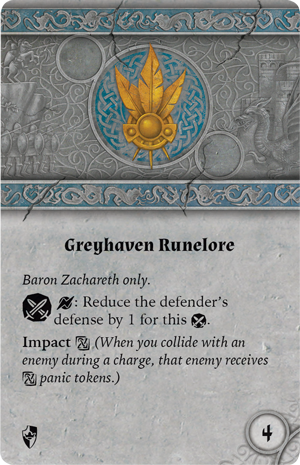 I wanted Greyhaven Runelore to reflect the idea of Zachareth empowering himself and Backbreaker with runecraft to fight better in melees. Giving them an armor-penetrating ability and inflicting panic through Impact fit their appearance and set Zachareth’s fighting style apart from other heroes. Then Nerekhall Training was a natural counterpoint that emphasized Zachareth’s ranged attack and the dark nature of his magical bolts. The ability to inflict banes is rare for Daqan units, but it felt right on theme for Zachareth. 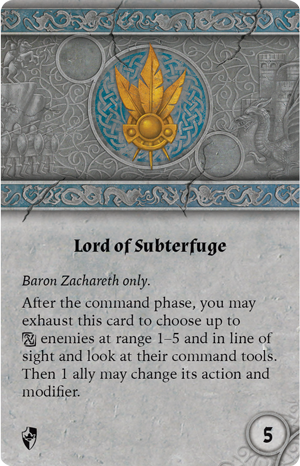 The effect on Lord of Subterfuge came out of a desire for Zachareth to have a utility card that represented his cloak-and-dagger style of command, enabling him to gaze into the intentions of his enemies and adjust an ally’s plans. 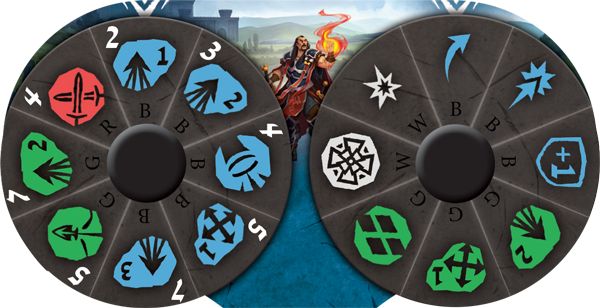 Runewars Miniatures Game rewards players for predicting their opponent’s moves, and having the chance to access this information and react accordingly makes a player more unpredictable. However, Zachareth has to take on additional risks by coming fairly close to enemy units in order to use this ability. Champion cards are the other crucial half of a hero’s upgrade design. 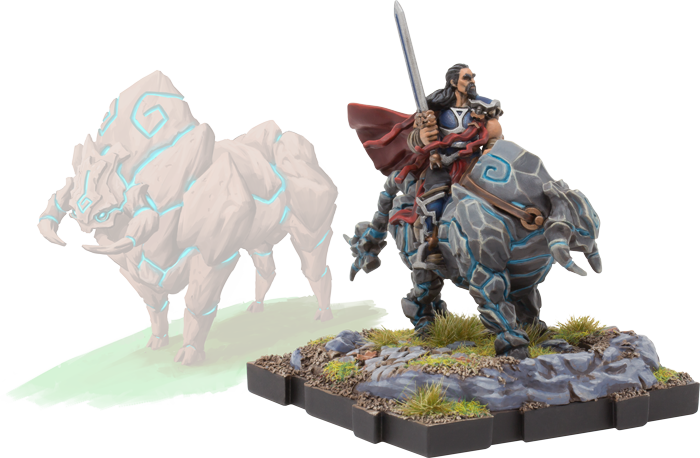 The option to have heroes lead elite units is both visually and thematically important in Runewars Miniatures Game. For the sake of balance and components, this often means focusing on one ability for the hero to share with their unit. We wanted Zachareth’s champion cards to be useful for both ranged and melee-focused units. It’s a new capability for Daqan heroes, and Zachareth is a leader with no problem directing a ruthless hail by elite crossbowmen. When he joins a unit, his dice effect offers wider versatility, especially with increasing the chance to trigger surge abilities. 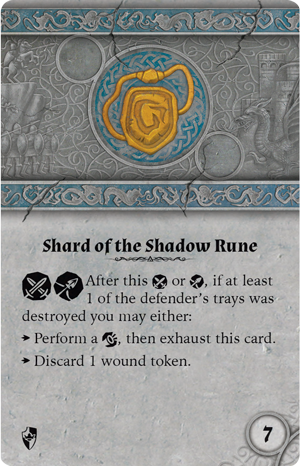 Finally, we felt that Zachareth’s artifact card should be a nod to the prize he coveted in Descent: Journeys in the Dark Seond Edition, which brought us to the Shard of the Shadow Rune. 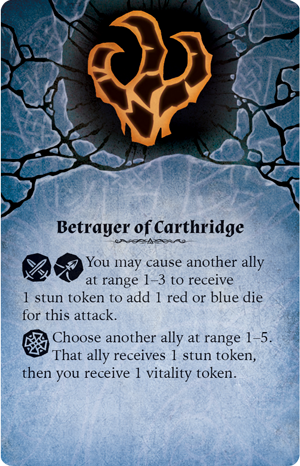 This card represents the portion of the Shadow Rune that Zachareth owns, tempting him to darker deeds. We wanted this to be the first Daqan artifact to represent the ambiguous sides of Terrinoth's past and present, rewarding acts of destruction with greater power. In the end, Baron Zachareth has become a favorite character of mine when playing Daqan armies. Sometimes, it’s just fun to be the anti-hero! We hope you enjoy playing with Baron Zachareth as much as we did in bringing him to Runewars Miniatures Game! Do you believe that Baron Zachareth is capable of redemption, or will temptation draw him back down the path of darkness? There are no clear answers, but whether his intentions are noble or dishonorable, you can be sure that he will lead the Daqan forces with a tact unmatched in Mennara. Recruit Baron Zachareth to your cause and witness the warlock’s full power! You can add Baron Zachareth to your Daqan army in Runewars Miniatures Game with the Baron Zachareth Hero Expansion (RWM32) here! 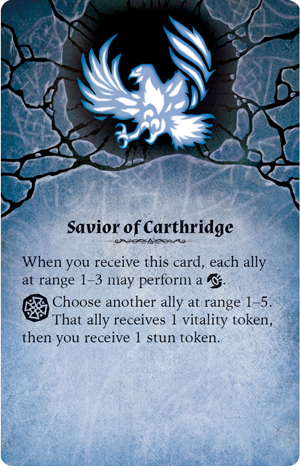 Or, if you wish to see his origins in the Terrinoth universe, you can pick up your own copy of Descent: Journeys in the Dark (DJ01) here!